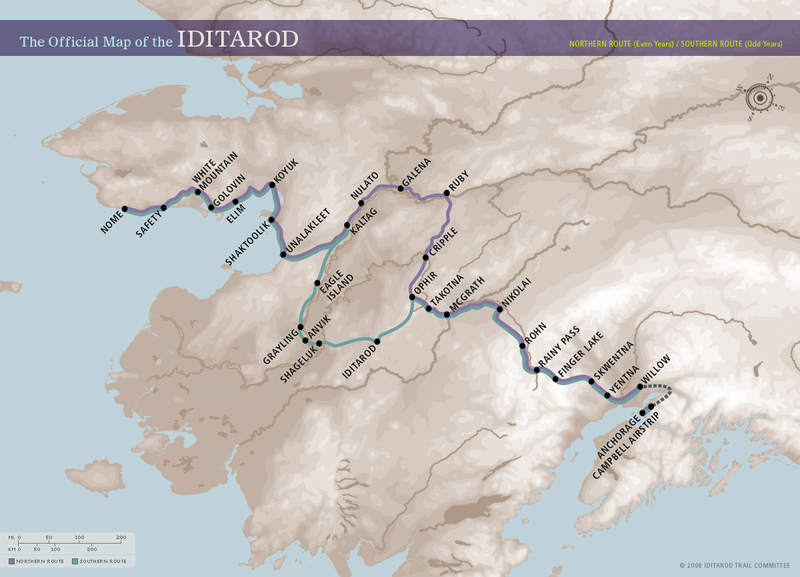 This Iditarod Trail map, both the northern and southern route map, can be downloaded and printed out. Maps for the northern and southern trails along with trail descriptions can be found at this link. Map of Alaska or Other States. Choose the size you’d like your map to be and print it on the appropriate number of pages. You can also print your state map at the ‘same size, using the same number of page’ but this won’t be in scale with the Alaska map. Click here to visit the Owl and Mouse website to get your free state map. The Official Iditarod Trail Map as sold at our Iditarod Online Store can be found at this link. Larger Map Banner; This is a 4 foot by 6 foot vinyl map banner that can be hung as a bulletin board in your classroom. It is a large Alaska map that shows the Iditarod Trail that can be used year after year. Learn more at this link. Educators shares tips on creating Iditarod maps for student use. I used the map from the website after getting your permission to do so. I printed it and had it enlarged. The cost of enlarging the map was about $10. If I’d had it done in color, it would have been considerably more. I am a new faculty member at University School of Jackson, but have taught the Iditarod for several years with my teaching partner in Albany, Wisconsin. When I came to this school, I was searching for someone to collaborate with on the Iditarod. Ms. Allan, an 8th grade teacher, was teaching The Call of the Wild and was willing to collaborate on a project. With the main character in The Call of the Wild being a dog, what better way to introduce the Iditarod. Very few students understood what the Iditarod was or what it takes to be in the Iditarod. After an introduction, the students researched about the Iditarod and chose the musher they wanted to follow for the race. I’ve included two pictures. One is an enlargement of the Iditarod map. Students tracked their mushers daily whenever new race positions were posted (usually in the morning, lunch, and afternoon). The other picture is where I would post the race positions along with images from the trail and news reports. The hallway was a traffic jam every time a new posting went up. The 8th graders had a blast following the Iditarod and learning something new – it will become a yearly tradition for University School of Jackson. *Educators: You are granted permission to print out and use maps found at www.iditarod.com for educational use in your classroom. These maps may not be commercially reproduced without our permission.